Gauss’s law was formulated by Carl Friedrich Gauss in 1835. It is one of the four Maxwell’s equations that form the basis of classical electrodynamics. Gauss’s law plays an important role because it reveals a simple relation between field and particle distribution. In the context of electrostatics, using Gauss’s law can greatly simplify the calculation of electric field given a symmetric charge distribution. Therefore, it is both interesting and significant to look at the derivation of Gauss’s law. Here we will only be looking at derivation of Gauss’s law applied to an electrostatic field, by showing its relation with Coulomb’s law. Gauss’s Law can be expressed mathematically in integral form and differential form. They are equivalent and related by divergence theorem. Gauss’s law is essentially equivalent to Coulomb’s law. In fact, any “inverse-square law” can be formulated in a way similar to Gauss’s law. In physics, many complicated problems start from some simple cases, and then extend to general forms. We can utilize the idea to derive Gauss’s law. 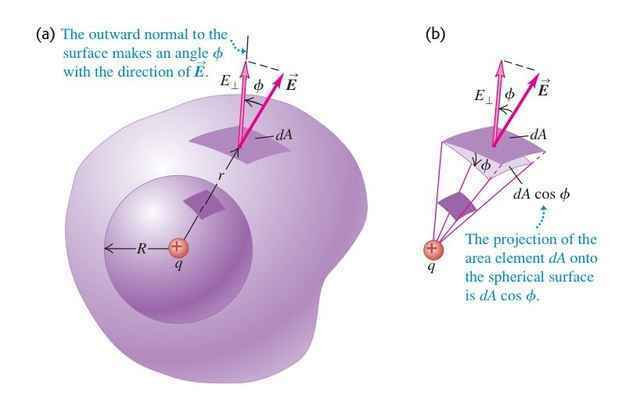 We will divide our problem into three parts, one more general than the other: point charge inside a spherical surface, point charge inside a non-spherical surface, and arbitrary charge distribution inside a non-spherical surface. which matches the form of Gauss’s law. We can begin to see why Gauss’s law is equivalent to Coulomb’s law. ΦdA = E⊥dA = EdA′, dA′ is the area of the corresponding spherical area element. We can divide the entire irregular surface into such area element, and integrate to sum the result. So the total electric flux through the irregular surface, must be the same as total flux through a sphere, which is already derived in step 1: ΦE = ∮ E·dA = q/ε0.We now have derived Gauss’s law of a point charge in any shapes of surface in a static field. Therefore, we have derived Gauss’s law: the total electric flux through a closed surface is equal to the total charge inside the surface divided by ε0. The famous Faraday’s ice-pail experiment confirms the validity of Gauss’s law. More importantly, since Gauss’s law is an alternative of Coulomb’s law, Faraday’s experiment provides a more precise prove of the inverse-square relationship, because Coulomb’s experiment method, using a torsion balance and dividing of charges, is not very accurate. The experiment goes that we mount a conducting container on an insulating stand. The container is initially uncharged. Then we hang a charged metal ball from an insulating thread, lower it into the container, and put the lid on. Charges are induced on the walls of the container, as in graph(b). But now we let the ball touch the inner wall (c). The surface of the ball becomes part of the cavity surface. If Gauss’s law is correct, then net charge on the cavity surface must be zero. Thus the ball must lose all its charge. By withdrawing the ball from the container and verifying that it is uncharged, and that the charge on the container is unchanged, we can verify Gauss’s law in static field. We have derived Gauss’s law by applying a commonly used method in physics: start from simple and extend to general case. We’ve also seen experimental proof of Gauss’s law and its significance. The same analytical process can also be applied to Ampere’s law, another important equation of Maxwell’s four equations. However, note that we haven’t got complete derivation of Gauss’s law here. We’ve proved Gauss’s law for charges inside a surface, but we have not discussed charges outside a surface. Also Gauss’s law apply to all fields, not just time-invariant ones. Currently a high school student, passionate about physics, especially areas of theoretical particle physics. Benefited a lot from study of physics MOOCs and great platforms like Physics Forums. I am surprised youre in high school. Nice. Congratulations.